My cameras and phones have never been really good enough to get good macro shots, so here are some close-ups of architecture: Sagrada Familia church in Barcelona, Spain; the capital of a Corinthian-style column in Venice; a bench wall by the sea in Palma de Mallorca, Spain. And just for fun, I was playing with my phone today, so here is a close-up of my cat Juhani. You can find more close ups at the original Lens-Artist challenge. It’s been awhile since I posted cat pics! We’ve now had Juhani for a year after adopting her from the shelter where I used to work. She’s a total sweetheart, and she gets along with younger brother Jolee really well (for the most part…). Jolee causing trouble, Juhani watching innocently. 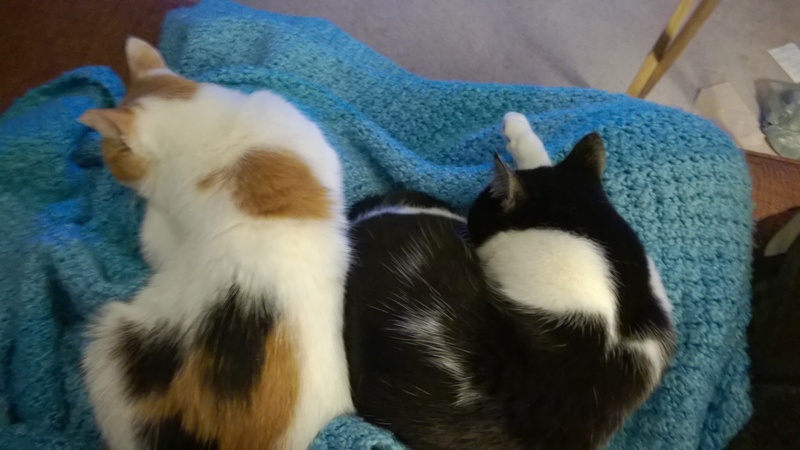 They sleep on my legs while I’m writing. It’s Trick-or-Treat in our neighborhood right now, so I’m handing out Snickers and Gobstoppers while watching The Nightmare Before Christmas. I’ve seen some Ninja Turtles, Olaf the snowman, a Power Ranger, pirates, Captain America, something from Monster High, and a possible Artemis/Diana. Our newer cat Juhani has the patience of a saint and barely fussed when I put some Princess Leia buns on her head. (They were made for a small dog…) Kinda fitting that a cat named for a Jedi is “dressed” as another Force-sensitive woman. She looks murderous here, but she’s really just sleepy. After at least a year of “thinking about it,” my husband and I got a new cat in January! Her name is Juhani, after the Knights of the Old Republic character. You may recall that our other cat is named Jolee, also a KOTOR character. 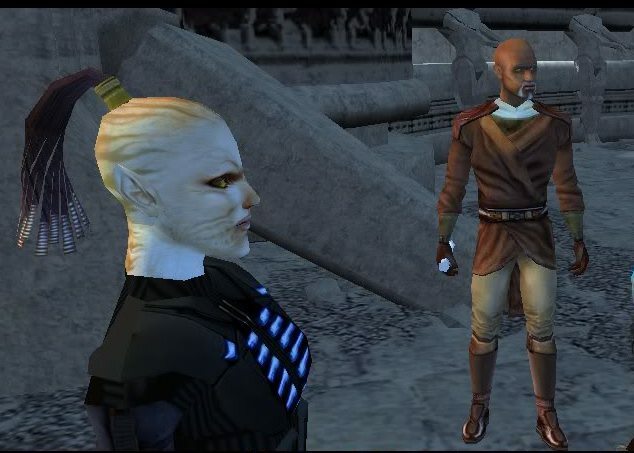 Juhani is a female Cathar whom you meet on Dantooine; I think she is the only character where you have a choice as to whether she joins your party or not. Our Juhani is around 4-5 years old and came from the local humane society where I used to work. We wanted a cat that would be able to play with (or just tolerate) Jolee, who very active and attention-hungry. In fact, we wanted a cat that was as little like Jolee as possible. I love him, but one is enough. Juhani arrived at the shelter with a broken jaw, possibly as the result of a car accident, and was healed enough to be put in the “adoptable” category just a few days before we came wandering into the shelter. We thought she was beautiful, and my husband even suggested that we could call her “Juhani” due to the orange stripes on her head. Her left ear is “tipped,” probably due to a spay-and-release program, and the end of her tail is white, just like Jolee’s. We kept her separated in the spare bedroom for about a month, slowly introducing her to Jolee a few hours at a time. It was actually a lot of work. She is not super timid, but he has no manners and is overly enthusiastic around other cats. He still occasionally greets her by walking up and swatting at her tail, or licking her paws while she naps. We started by feeding them treats together, and then playing with a wand toy. He got squirted with the squirt gun when he was too aggressive and jumped on her (doesn’t help that he’s got several pounds on her). At some point, she bit him on the neck and it got infected, which earned him a trip to the vet and some antibiotics. Unfortunately, they made him nauseated, and he threw up all over the house for several days, including on our bed, in the office, and on a living room chair. At least he shouldn’t have any hairballs for awhile. Juhani is ready to roam. Her front left leg has an old injury. After about a month, she was unhappy being shut in the room every night, so one weekend we let her out 24/7 and no one died, so we have left her out ever since. They eat together beautifully and even chase and roughhouse a bit with no hissing involved. She is really a wonderful cat: laid-back, sweet, playful, and very much a lap cat.